Intus Healthcare have been helping people with Sleep Disordered Breathing (SDB) for many years, supported by a number of e-commerce and educational websites. It is an important field to be involved with, after all, everyone understands how a person's life can fall apart if they do not experience and enjoy healthy sleep. It is estimated that there are more than 500,000 people in the UK alone with undiagnosed OSA and that due to its close links with diseases like obesity and diabetes these figures are growing exponentially every year. In the UK, the NHS does its best to diagnose and treat as many people as they can, but it cannot reach the large majority simply due to a lack of resources, especially with the NHS cut-backs cited in the media. Intus cater for both private-paying individuals across Europe and supply numerous NHS Hospitals and sleep clinics with equipment throughout the UK. • PAP (Positive Airway Pressure), including CPAP machines and CPAP masks. We also distribute a number of other condition-associated health products, see our full website list. 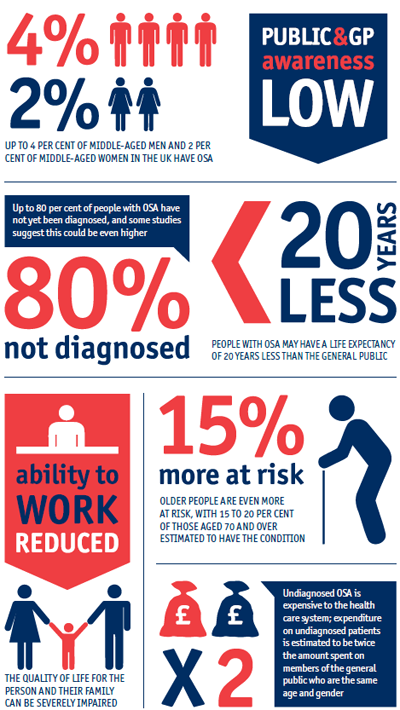 Infographic created by the British Lung Foundation.